Federal's American Eagle brand of ammunition is a great source for quality, reloadable training ammunition for pistols, carbines, and rifles. Available calibers run from small pistol calibers like the 380 Auto, all the way up to larger rifle calibers like the 50 BMG. This 9mm Luger ammunition is loaded with a light 115 grain full metal jacket bullet. This bullet weight is great for sub-compact handguns, like the Glock 26 and M&P Shield, as well as compact and full size pistols; and the FMJ bull is ideal for range training. This ammo will have a very similar trajectory and felt recoil to that of expensive self-defense loads. 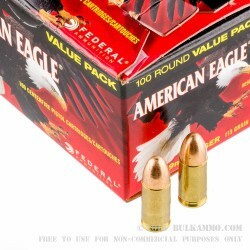 Federal American Eagle ammunition is produced alongside Federal premium ammo. Each round is loaded using a Boxer primer and a brass casing. Good ammo, fast service.....will order again for sure. Bulk Ammo shipped same day with delivery in two days. Federal American Eagle ammo is clean with zero issues through 1000 rounds. My First Choice in Range Ammo. Bulk am is the best! Awesome Bulk Ammo price for premium rounds. I highly recommend this sight! Great price, great service, no hidden fees and costs. I have shot about 25% of my purchase and have had no issues so far with the quality of ammunition. 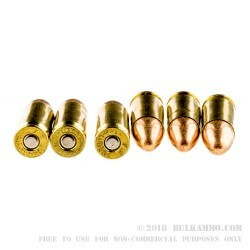 Bulk ammo, great place to start if your wife suddenly decides she wants to learn to shoot pistols and rifles. Don't get me wrong it's a great thing, but working ammo into your budget to shoot at just targets in this economy is a challenge. 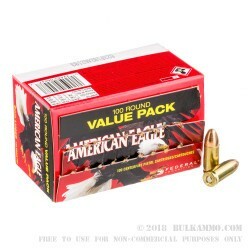 Finding good quality target practice ammo at good prices with fast shipping was easy with bulk ammo. 1st time buyer. The delivery arrived on time. Great price, the best I could find online or at stores. Shot over 200 rounds with no jams or misfires. A time saving way to buy Ammo. Delivered promptly. I'd like to thank bulkammo.com for their great prices and quick shopping. I'm a first time customer and now will be buying all my ammo as well as what else I need. They saved me a lot of $$. Thanks again. I recieved my ammo within 30 hours of placing the order. WOW!! This is my range ammo, hands down. Me & my father Inlaw shoot this ammo at the indoor range. We've gone through 700 rounds between us. We both think it's quality range ammo. Shoots clean and consistent. I'll continue to buy online from BulkAmmo because they're straight up about what they do, and they do it well. brought it, used it, loved it. would use it again and again. and with bulk ammo you can't go wrong, great people and service to boot. A: Federal American Eagle does not load any steel components in any of their handgun rounds. These will be a standard construction of brass case, copper jacket and lead core. Nothing in these will attract a magnet. A: Hello Surry! According to Federal, the muzzle velocity of this American Eagle round is 1180 fps. The listed muzzle energy of this round is 356 ft. lbs. Q: Where is this manufactures and Is this round completely non-magnetic and safe for restricted indoor ranges? A: Hello! 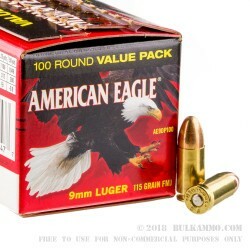 Federal American Eagle ammunition is domestic made and does not contain any steel. It will be completely fine for use at ranges that require a magnet test.